Oren's Money Saver: Up to 5x (10%) eBay Bucks - Today and Tomorrow! Update: This offer seems to be more targeted than usual. Many people are reporting that they did not get the targeted email they seem to receive every time there is an increased eBay Bucks offer (I didn't get either this time). I hope it is just because it's the highest denomination of eBay Bucks increase. Hopefully it is a not a sign of things to come. We'll see. 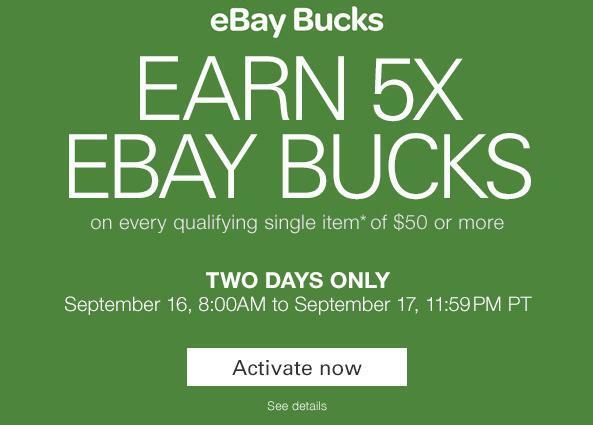 5x eBay bucks on any item of $50 or more. If you didn't buy those ExxonMobil gift cards, now (better said, after 11am ET) is the time to buy them.